Boston, Massachusetts - A delegation of Arab ambassadors, organized by the National U.S.-Arab Chamber of Commerce (NUSACC), today wrapped up a high-level visit to the annual meeting of the National Governors Association (NGA) in Boston, Massachusetts. The delegation consisted of Bahrain's Ambassador to the United States, H.E. 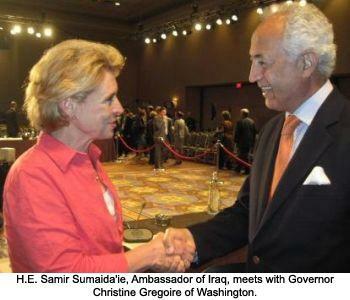 Houda Ezra Nonoo, Iraq's Ambassador to the United States, H.E. Samir Sumaida'ie, and Morocco's Ambassador to the United States, H.E. Aziz Mekouar. "Meeting face-to-face with the nation’s Governors provides the Arab ambassadors with a unique opportunity to build long-term relationships with some of America’s most visionary leaders," said David Hamod, President & CEO of the U.S.-Arab Chamber. "On a State-by-State basis, no one in the United States today is more committed to promoting exports and attracting foreign direct investment to local communities than the U.S. Governors." The ambassadors attended as official "observers" and participated in a number of NGA working sessions in that capacity. Through the National U.S.-Arab Chamber of Commerce, they also met with business leaders from around the country. "I came to Boston with my fellow ambassadors to meet as many Governors as possible and to gain a better understanding of how they run their respective States," said Ambassador Sumaida'ie of Iraq. "I learned a great deal, and this experience also enabled me to bring new, positive developments in Iraq to their attention. In addition, there was an unexpected bonus: we met with a substantial number of business leaders from all sectors, and we were able to brief them about business conditions and opportunities in our respective countries. That was very valuable." In recent years, according to NUSACC data, U.S. exports of goods and services to Iraq have more than doubled, from $2.5 billion in 2006 to expected sales of nearly $5.5 billion by the end of this year. As a result, Iraq has become America's fourth largest export market in the Middle East and North Africa (MENA) region, and the numbers continue to grow as Iraq matures politically and economically. Her Excellency Houda Nonoo, Bahrain's Ambassador to the United States, raised awareness about the Kingdom of Bahrain, home to the Fifth Fleet of the U.S. Naval Forces Central Command. "High profile events like these play a vital role in putting Bahrain 'on the map' for the nation's Governors and America's business leaders," she said. "These interactions are an important first step toward building long-lasting relationships, and I am confident that we will see some of these Governors and business people in Bahrain in the not-too-distant future." ​Bahrain was the first nation in the Gulf Cooperation Council (GCC) to sign a Free Trade Agreement with the United States, implemented in 2006. Over time, this agreement reduces tariffs between the two nations to zero, enabling Bahrain to serve as a regional gateway to the U.S. market. With this in mind, Bahrain recently signed a Memorandum of Understanding (MOU) with the Boston-based Massachusetts Office of International Trade. The Kingdom of Morocco has also signed a Free Trade Agreement with the United States - the first such agreement in Africa - and Morocco's ambassador was in Boston to highlight the advantages of doing business with his nation. H.E. 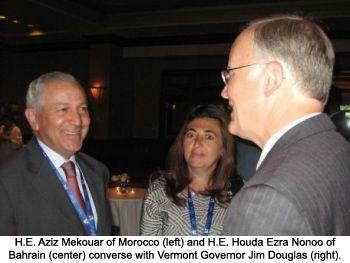 Aziz Mekouar described Morocco as "open for business with the United States. I was happy for the opportunity to deliver this message in Boston to the business community, as well as to state Governors attending the NGA annual meeting. The NUSACC trip to Boston was a unique and highly valuable opportunity." The economic recession drove down exports around the world in 2009, but Morocco bucked the trend. U.S. exports of goods and services to Morocco climbed to $1.6 billion in 2009, a 12 percent increase over 2008, and U.S. investment in Morocco has also been on the rise. The top exporting States to Morocco included Louisiana, Kansas, Virginia, and Alabama, to name just a few. The National Governors Association (NGA), founded in 1908, is the collective bipartisan voice of the nation's Governors and one of Washington DC's most respected public policy organizations. The annual meeting of the NGA brings Governors together to share best practices and address policy issues, and the gathering also presents opportunities for Governors to meet with government and private sector leaders from around the United States. ​This is the fourth year in which the National U.S.-Arab Chamber of Commerce has been privileged to lead a delegation of Arab ambassadors to the NGA annual meeting. Previous destinations included Traverse City, Michigan, Philadelphia, Pennsylvania, and Biloxi, Mississippi. This year's trip was made possible by generous in-kind support from Lockheed Martin Corporation. Said Ambassador Sumaida'ie, "I wish to express my appreciation for the hard work and impeccable attention to detail exhibited by NUSACC. You have an effective and highly motivated team, and you have been a pleasure to work with." 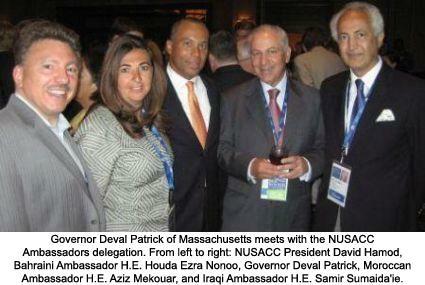 Concluded David Hamod, NUSACC's President & CEO, "The Chamber is honored to connect these thoughtful and articulate representatives of the Arab world with the nation's Governors, whose gracious hospitality has been second to none. These people-to-people gatherings go a long way toward promoting cultural understanding and building economic bridges. Such meetings create a win/win opportunity that has the potential to generate economic activity and create jobs in communities across the United States and throughout the Arab world."